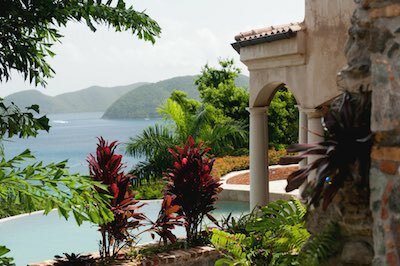 St John Villavacation's, Amorosa is close to the best beaches in the world! Enjoy the best views with St John's USVI famous north shore trade wind breeze! Villa Vacations - Amorosa is a 7 minute walk to the beach at St-John Peter Bay. A short drive to Cinnamon Beach, the most beautiful beach on St John. 4 Bdrms. Sleeps 2-8. In Peter Bay. From $6,400. Captures the old world splendor of a great Luxury Italian villa dating back hundreds of years. the best grilling area on the island! enjoy the pool that was designed to remain in the sun. do not get any better! All the modern conveniences blend in Perfectly. A tall private two bedroom guest house is to one side and a long stone staircase that wraps the waterfall and pool bar is to the other. Walk along the colorful vegetation, and imagine what is to come. in the distance and your cares will melt away! With the trickling 14’ waterfall and large outdoor bar, you will surely be in island mode. Lie in a hammock next to the pond and enjoy fabulous views like nowhere else in the USVI. At the pool deck, enjoy your favorite tunes, outdoor tv, cocktails, and wifi. Enjoy Incredible steaks and seafood. Hire our Villa chef for a real treat! This Luxury Villa Rental has Peter Bay’s best pool deck, with the pool itself in the sunny foreground. Swimming in the pool or relaxing in one of the chaise lounges, you can’t help but feel that you are at a true Luxury Villa rental on St John - Amorosa. Guests 2 years old and under are no charge. We encourage Saturday turnover unless previously arranged. Please inquire via email if you desire a different arrival/departure date. This is my third trip to St John. I had inquired with the owner specifically about the view and the possibility of walking to a beach, which for me is what my winter vacation is all about. There are 3 high bedrooms here and the view may be obstructed from some of them by palm trees but it is still first rate and way outranks what I've been looking at for the last 3 months!! It was the ability to walk to the beach that made this location the best. My husband does all the driving and I hate to have to depend on him totally for beach visits. At Amorosa, you can easily walk to Peter Bay Beach. But you can also (not quite as easily but doable) walk to Trunk and Cinnamon. Trunk has 3 dangerous hairpin turns and with the roads so narrow, I chose Cinnamon Beach. Early almost every am I took my coffee down the road (careful of traffic but nothing much before 8) and walked the whole length of Cinnamon beach. Id say 10 minutes down, 20 minutes on the beach and 15 minutes back because it's a tad more uphill. My husband slept in and I got my 2+ mile walk in with no Jeep necessary. Going higher up for a world class view would have made this hike impossible. Beautiful house, great view and walking access made this my best vacation yet! Hoping for a repeat.